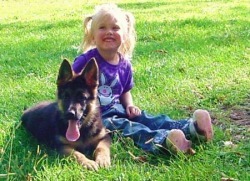 The German Shepherd Dog is also known as the Alsatian. It is handsome, well proportioned and very strong. The coat most often comes in black with tan, sable or all black, but also can come in blue, liver and white, but those colors are considered a fault according to most standards. White is not an acceptable color for the German Shepherd, however they are now being recognized as a separate breed, called the American White Shepherd. The nose is black most often black but, blue or liver still do sometimes occur, but is considered a fault can not be shown. It has a sturdy, muscular, slightly elongated body with a light but solid bone structure. Its head should be in proportion to its body, and the forehead a little convex. It has a strong scissors bite, ears wide at the base, pointed, upright, and turned forward (the ears of puppies under six months may droop slightly). The eyes are almond-shaped, never protruding, dark, with a lively, intelligent expression. Its bushy tail reaches almost to its hocks and hangs down when the dog is at rest. Its front legs and shoulders are muscular; its thighs thick and sturdy. It has round feet with very hard soles. There are three varieties of the German Shepherd: rough-coated, long rough-coated, and the long-haired.